Junior Summer Courses 14 Vinehall School 8-12 years * 8th July - 11th August * minimum 2 weeks Location Vinehall School is situated in an area of outstanding natural beauty just outside the village of Robertsbridge, which is located close to the small town of Battle and not far from the coastal resort of Hastings. 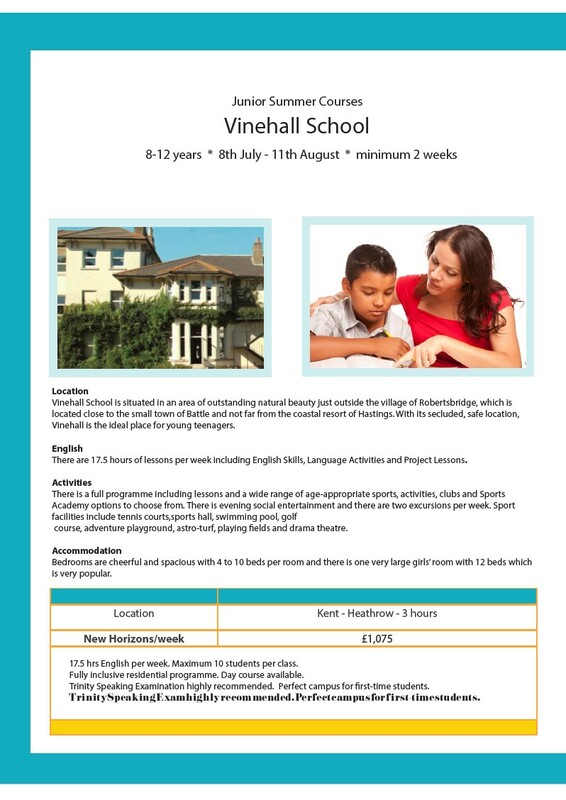 With its secluded, safe location, Vinehall is the ideal place for young teenagers. English There are 17.5 hours of lessons per week including English Skills, Language Activities and Project Lessons. Activities There is a full programme including lessons and a wide range of age-appropriate sports, activities, clubs and Sports Academy options to choose from. There is evening social entertainment and there are two excursions per week. Sport facilities include tennis courts,sports hall, swimming pool, golf course, adventure playground, astro-turf, playing fields and drama theatre. Accommodation Bedrooms are cheerful and spacious with 4 to 10 beds per room and there is one very large girls’ room with 12 beds which is very popular. Location Kent - Heathrow - 3 hours New Horizons/week £1,075 17.5 hrs English per week. Maximum 10 students per class. Fully inclusive residential programme. Day course available. Trinity Speaking Examination highly recommended. Perfect campus for first-time students. Trinity Speaking Exam highly recommended. Perfect campus for first-time students.